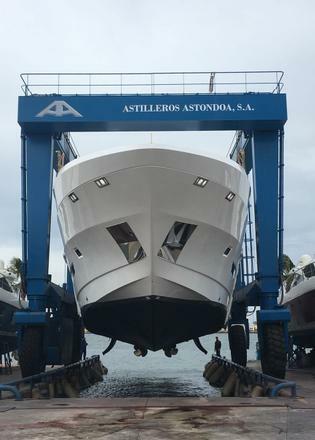 Spanish yard Astondoa has announced that the second hull in its 110 Century series has been launched for a European owner. 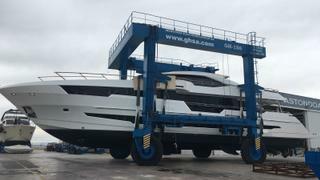 The follow-up to hull number one Sophye, which was given a global debut at the 2016 Miami Yacht Show, this 33.5 new metre tri-deck yacht will be based in the Mediterranean, the yard adds. Styled inside and out by Cristiano Gatto Design, the second Astondoa 110 Century has been heavily customised to suit her owner’s tastes. The décor is described as “modern, risky and balanced”, while the skylounge is likely to prove one of the most popular spots on board — both for hosting business meetings and social events. Accommodation is for up to ten guests split across five staterooms, including a foredeck master suite, two VIP cabins and two further guest cabins. Built to GL standards from a GRP hull and superstructure, the Astondoa 110 Century has a 7.03 metre beam and a maximum draught of just 1.8 metres — making this an ideal choice for shallow waters cruising. Power comes from a pair of 2,030hp MTU 16V2000 M84 diesel engines for a top speed of 24 knots. When trimmed back to 20 knots, the second Astondoa 110 Century yacht will boast a 600-mile range, drawing on a total fuel capacity of 13,700 litres. 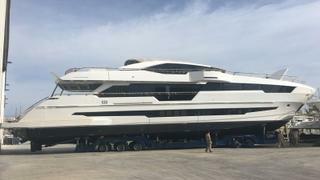 Other superyacht projects currently under development at the Spanish yard include the third Astondoa 110 Century yacht, which is due for completion before the end of the year.